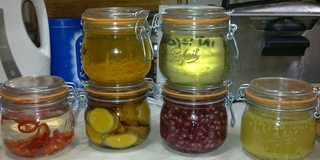 I miss the old thread, I am really keen on making flavoured spirits and the old thread had a lot of good recipes and advice. I had been hoping that someone would remake it but I checked the old thread and the author (devil wears wings) hasn’t posted in it since May 2009 so in the spirit of not getting messily devoured here’s my attempt. Anyone who didn’t see the old thread or is new to making alcohol infusions: you like alcohol or you wouldn’t still be here and you’re in GWS so I’m betting that you also like other tasty things. So why not try putting your tasty things into your alcohol? That sounds great but why would I bother when I can already buy fruit liqueurs at the shop? Well there’s the usual home-made stuff is better arguments including some commercially available liqueurs having artificial flavourings etc. Flavoured drinks tend to be horribly overpriced compared with the plain versions. There is a very poor choice of flavours and if you make your own you could have anything you want. Making your own flavoured spirits is pretty easy and while it can take several months that is all waiting time. There is minimal effort and prep involved and you won’t need any fancy equipment. Just a bottle, some flavours, some booze and a whole lot of patience for which you will be rewarded with tasty alcoholic beverages. Also unique and tasty booze makes you popular at parties and is a good talking point. Ok you’ve convinced me to give this a go; what do I need to get started? -A spirit (usually at least 40% or 80 proof) to flavour, vodka is a good first and all round spirit as it has very little flavour of its own and so can showcase the flavours you have put into it without interfering. -A thing to flavour it with – your fruit, berries, coffee or whatever. -Some clean air-tight glass jars or bottles in which to work your magic. -Something to strain the residual fruit etc out of the alcohol. Cheese cloth would be good for this but I use a sieve. -Something to filter the strained liqueur. I pour it through paper coffee filters in a plastic cone but the metal ones work fine. Don’t use any sort of coffee machine that heats the liqueur though. -Optional sweetener such as simple syrup (a 2:1 sugar:water solution) or honey. -A cool, dark place out of the reach of children, housemates and other alcohol thieves. I’ve got my jars etc now how do I work this tasty alcohol wizardry? The first thing you need to do is select and prep your ingredients. Generally speaking the stronger the flavour/smell the less you need to use. Wash anything that needs washing, chop large fruits, pierce anything with a hard skin like sloes to increase the surface area and bash any whole spices like allspice, pepper or coffee to crack them. Only use the zest of citrus fruits. If you are new to infusing you should try single-flavour infusions before you make any more complicated, multi-ingredient liqueurs as these can be a bit of a juggling act between flavours that infuse at different rates. Then you put your prepped solids in a clean, dry, jar or bottle. There is no need to sterilise the vessel first if you are using 40% (80 proof) or greater alcohol content as this will kill any bacteria. Now you pour the spirit over the solids and close the jar and begin the waiting game. You may want to shake your infusion periodically, as a general rule I shake mine a couple of time a day for the first week and then a couple of times a week after that. If your fruit is floating on the top of the spirit shaking will be a necessity to prevent spoiling unless you weigh it down with a bag of water or a small bowl. There are three main steps to the creation of the flavour. Steeping, filtering and ageing. Filtering is the active part and the other two pretty much involve leaving it to sit. Steeping is the part of the process that occurs while the solids are still in the alcohol. Ageing is the part of the process that occurs after you filter out the solids. During the steeping do not be alarmed if your fruit loses its colour. The colours and flavours are all moving into the spirit however if your infusion is still lacking in flavour after the fruit has no colour then you will need to remove the fruit and add a new batch of fresh fruit. When your infusion has been steeping for the right amount of time according to your recipe or taste you need to remove the solids. First you run the infusion through a coarse filter like cheesecloth or a sieve. Do not worry if small bits of solid go through this. You should squeeze as much liquid out of the solids as you can by pushing with the back of a spoon or wringing if you are using cheesecloth. Don’t use a potato masher or otherwise mash any soft fruits as this will form a sort of mush that can actually increase the amount of alcohol lost. -Fresh fruits and berries need several weeks to a couple of months steeping and at least a month ageing. -Dried fruits and berries need a couple of weeks steeping and at least a month ageing. -Oily stuff with strong flavour (coffee, lemon peel etc) needs couple of days to a few weeks steeping and at least two months ageing. Although if you don’t like your coffee to have the bitter coffee kick at all take it out after a few hours. -Dried whole spices, chillies and herbs need a few days to a week steeping and minimal ageing. -Powdered spices and fresh herbs need a day or two steeping and minimal ageing. -Candy (skittles etc) needs pretty much until it’s dissolved (some hours) and no ageing. Of course there are exceptions to all of these and generally speaking if you are in doubt then open it up and taste. If you are steeping you are tasting it to see if all the lovely flavours are there yet. 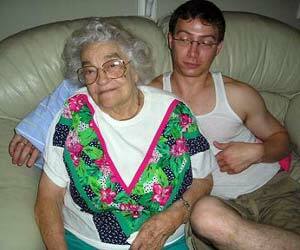 If you are ageing then you are tasting to see if they have mellowed sufficiently. Don’t worry if your infusion tastes a little bitter during or straight after the steeping. The ageing process will reduce the bitterness. As someone in the previous thread said far more eloquently; before ageing your infusion should taste like (for example) coffee followed by vodka. After ageing it should taste like coffee vodka i.e. a much smoother and more unified taste. If you are making a liqueur, this is the usual point to sweeten it. I only sweeten those infusions that I intend to drink neat. I like to make a saturated sugar solution by heating water in a pan and adding sugar until it no longer dissolves. I then use this solution to sweeten my liqueurs to taste. You can also follow the recipe for simple syrup. Personally I like to leave it to age for another few days or a week after sweetening before I actually drink the liqueurs. I do not bother to sweeten those drinks I am going to use to mix into cocktails because I can add simple syrup to taste when I make the cocktail. I also don’t sweeten the infusions that I am planning on using for cooking. Caramelised onion vodka makes for some tasty flambé! So what have you learned? I don’t want to repeat your mistakes! 1. There is no point buying top-end spirits for making your own infusions. But also don’t buy the cheapest spirits either as these will leave bitter notes in your liqueurs. Mid ground spirits such as Smirnoff, Gordon’s etc are usually best. I’ve had good results with supermarket own-brand but premium stuff but this is in the UK so YMMV. 2. Don’t be afraid to throw out failures. Sometimes nasty tasting infusions can improve with age. If it tastes a little bitter then age it for a few more weeks and see but if it tastes wrong or mouldy pour it straight down the drain. 3. Remember to shake often and taste sometimes too. Taste more often with stronger flavours like chilli and coffee which can over-infuse. 4. Use a permanent marker to write on the outside of your infusion jar what is in it, when it went in and when it came out. Or keep a record of this elsewhere so you can repeat successful recipes and adjust those that need it. 5. Fruit continues to ripen while infusing so if you use very ripe or over-ripe fruit then you can end up with some pretty funky over-ripe flavoured spirits. I have never known this to be a good thing. 6. Only bother with the peels for citrus fruit and make sure that no pith gets anywhere near it. So what have you actually made? 1. Four kiwi fruit in vodka steeped one month, aged one month. I didn’t filter this well enough and had to throw it out. 2. A handful of crushed coffee beans and a split vanilla pod in rum, steeped one month aged two. This was amazing and the first liqueur to go. It had a really strong coffee flavour which I like and it aged beautifully with the vanilla. 3. Two mangoes in vodka steeped one month, aged one month. This was disappointing and if I made it again I would add a second batch of mango and steep a second time. 4. Ginger and the zest of three lemons in rum steeped two weeks. Then I filtered it, added more ginger and steeped another month and aged two months. This was quite nice but didn’t have the fiery ginger kick I was hoping for. 5. Apples and a cinnamon stick in brandy, steeped one week then removed the cinnamon and steeped for another month and aged for two months. This is glorious and I have more on now that I think will make for perfect Christmas gifts. 6. The zest and meat of two oranges and a handful of crushed coffee beans in vodka. This was quite nice but another time I would add more coffee, more orange zest and omit the meat. All of these except the brandy were sweetened to taste to make liqueurs. 1. Zest of three oranges in gin, steeped three weeks, aged two months. This is very nice and I didn’t sweeten it because I drink it with tonic. I liked this but I probably wouldn’t bother again as the flavour is little improved over sticking a couple of slices of orange into a normal G&T. I might try sweetening into a liqueur. 2. Basil vodka steeped for two days and aged two months. The jar was almost full of leaves when they were in there. I am not a huge fan of this but it has got good reviews here. 3. Two “red chillies” in vodka steeped for four days and aged for a month. I didn’t sweeten this because it tastes like fire and needs mixers. Makes an excellent bloody Mary though. 4. Ginger in rum, steeped one month then the ginger changed and steeped another month then aged two. Still sadly lacking in ginger flavour. I am going to try this again but grate the ginger first to increase the surface area. 5. The seeds of two pomegranates in vodka. Steeped one month and aged two. This didn’t have a strong pomegranate flavour but was quite drinkable and needed very little sweetening. 6. The seeds of four passion fruits in vodka steeped one month and aged two. This is excellent and by far the most successful of the fruit infusions. 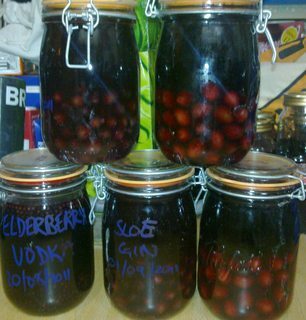 The bottom left is filled to about a third with elderberries and using vodka. The rest are around a third full of pierced sloe berries in gin. I am planning to steep around a month and a half to two months and age until Christmas. There is still time to get some sloe gin on and sloes are still in season so get picking. Sloes taste better after the first frost but I didn’t want to wait so I stuck them in the freezer for a day first. I will let you know how it went when these are done. Where can I go for some more ideas, recipes and other information? Do NOT use pure essential oils as a shortcut to flavouring your spirits. It might sound like a good idea but you might accidentally poison somebody. If you are using apples or fruits with stones (fruits in the Prunus or Malus genera) it is a good idea to remove the stones/pips before infusing. Under no circumstances break or crush the seeds of these fruits before infusing or you can get cyanide compounds in your liqueurs as well as tasty flavours. If you are using fresh herbs, avoid any with known pharmacological effect such as valerian and St. John’s Wort. If in doubt ask here or check elsewhere on the internet. Don’t add any liquids before or during steeping as this can lower the alcohol content enough to allow bacteria to grow. I have seen some stuff on here about improving cheaper vodka by running it through Brita or charcoal filters. If you do this then make sure you do it before you infuse or you will just ended up removing all the tasty flavours you have waited so long to get in there in the first place. Have fun, make whatever you want, enjoy tasty booze and don’t forget to post your results back here whether good or bad. Happy infusing! Edit: Feel free to discuss home made essences etc here too. It's basically the same thing just more concentrated. Seems pretty simple but what’s really going on in these jars? I must know more! This is a bonus section full of stuff you don’t NEED to know but I think is interesting. Delicious foods have their flavours because of several classes of volatile compounds which are collectively known as aroma compounds. Many of these are commonly known as essential oils and will readily mix with other oils but not water. Ethyl alcohol is a reasonable good solvent for a lot of these tasty compounds. In some cases the surrounding alcohol is a better solvent for the flavours than the watery liquid inside the fruit. This means that during steeping you are performing a solvent extraction of these compounds (this effect is greater the higher the alcohol content of your spirit.) Some of the delicious molecules will be equally or maybe even less soluble in the spirit than the fruit but as long as they are soluble in alcohol diffusion will still see the majority move to the greater volume of alcohol. Also water and ethanol are miscible and the ethanol you are using already has water mixed into it. This means that some (but not all) flavours will infuse much better in higher proof alcohol. 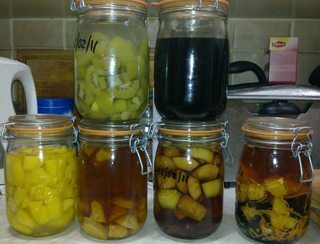 However using higher proof alcohol can sometimes result in more of the bitter flavours infusing too. This increases the risk of over-infusing (like happens to stewed tea.) Another thing to consider is that these infusions will also require more diluting to get to a neat-drinkable alcohol content, Sometimes when you dilute these infusions the water-insoluble flavor compounds will be forced out of solution by the reduced alcohol content and the mixture will turn cloudy. This effect can be desirable and is seen in spirits like ouzo and absinthe where it is called louching. Alcohol forms emulsions with, for example, cream and this is the basis for drinks like Baileys and advocaat. Some of the flavor molecules break down with time, temperature or exposure to UV light. This can be beneficial, especially during ageing, when the harsher more bitter compounds break down and the drink becomes sweeter with a more complex flavour from the increased variety of flavours present. This can also rob your infusion of flavours that you want which is why you should store your infusions (and all good alcohols) in a cool and dark place. However you don’t want it too cold or you can inhibit the desirable flavour developments (the same reason you shouldn’t keep tomatoes and some other fruits in the fridge.) Also liqueurs should always be served at at least room temperature so you get benefit of the full aroma. There is no point trying to infuse into a spirit that is already flavoured. Firstly the stuff already in the alcohol will make it a worse solvent for extracting new flavours. Secondly these flavours will already be aged and so may break down further or lose potency while the newly added flavours are ageing. The exception to this is using spirits like rum or whiskey where the flavour is a result of the process used to make it or takes years to steep/age properly like the flavour from wood casks. Sweetening your liqueurs with simple syrup or other water based sweetener obviously affects their alcohol content. So you should avoid sweetening to overcome bitterness that could be resolved by further ageing if you want a stronger liqueur. Lower alcohol content can also result in fewer flavour molecules coming into the liqueur and is also a concern with very wet fruit like watermelon. You can add any pretty much any sweetener before ageing. The presence of the sweetener can affect the development of the flavour compounds in both good and bad ways. In my experience it has usually been good (especially if you are adding honey) however it can be hard to judge the sweet/bitter balance before ageing. So if you do add sweetener before ageing you should under sweeten and then add more after ageing if necessary. Some recipes call for adding sugar at the very start; this is only really necessary if you are using the sugar to toughen up soft fruits. Dried fruits and roots can give different flavours to their fresh equivalent. This can be a good thing if you are infusing goods that increase in flavor with drying like galangal or mushrooms. However if the dried fruit/peel is old then a lot of the oils might have been lost (like happens with coffee after roasting.) If you are using dried stuff then it should be as fresh as possible and you should not rehydrate it before infusing. I'm glad you made this. The most complicated thing I've done with actual liqueur is skittles vodka. I've been meaning to try something akin to your coffee and vanilla liqueur for ages and just haven't been "inspired" enough to try it. Thank you for providing the inspiration I needed. After reading the old thread, I knocked together some plum vodka. Nothing too fancy, just a bunch of plums in a glass jar and vodka to cover. What was interesting to me was how it changed as it infused. It got tart first, somewhat like the skin of a plum, and only later picked up the sweeter plum flesh flavor. I stuck it in a drawer for about a month, strained, and then back in the drawer for another month to age. I sweetened it in the end with a simple syrup, though I accidentally went a bit too sweet. It did turn out to be a great color, and very tasty despite a tetch sweeter than I'd prefer. Did some cucumber right before the heat up and killed all my crop in August. Also has a slight bit of sprite melon in it. I'll probably crack it open this weekend to see how it fared. The pale green isn't quite as appealing as the purple though. Green apple infused gin is the best thing. I've made a few citrus things too, the best of which was grapefruit vodka. The only drawback was that it turned a light yellow color and thus looked like a bottle of pee. Tasty though. One day I will make limoncello. Awesome thread! In terms of sharing easy ideas: I was recently really happy with Jack infused with jalapenos and coriander. Also, let me add that you don't *have* to toss out your failures, because you can use them for cooking! I had a jalapeno, coriander, cilantro and lime (juice--seriously, don't do that) monstrosity that is awful to drink, but works pretty well as a tex-mex cooking liquor. Ditto for the time I got kinda drunk and threw a bunch of Italian spices (rosemary, thyme, sage, oregano, basil, I'm sure other stuff) into some grain alcohol trying to make strega. Now my sauce tastes like it came from the kitchen of a delightful Italian stereotype! Anihoo, I could use some consultation from you more experienced hands. I celebrate fall by making a pumpkin pie vodka. In previous years, I just threw all the ingredients (cloves, cinnamon stick, fresh ginger, vanilla, pumpkin, molasses) into a carboy and let it sit, but it tended to come out kinda bitter and overwhelmingly clovey, with absolutely no cinnamon at all. The bitterness (which doesn't go away with aging) is easy to cover up by tossing in a little butterscotch schnapps, but it feels a little like cheating. The cloves are okay (I like it, and I have a buddy that must have gone through two liters by himself last year), but others do not care for them. I figure the solution there is to just use fewer and pull them sooner. A separate problem is that the pumpkin flavor isn't really there unless you leave a bit of pumpkin particulate in (not like enough to form a sludge, just enough to cloud the alcohol a little). I'm fine with that for my own purposes, but when I give bottles away, I have to tell people to shake their liquor so the vegetable matter at the bottom gets stirred up and they give weird looks. It is not ideal. So this year I tried what might be a neat solution: I figured some of the flavors, especially the pumpkin, might come out better if I cooked the spices in the pumpkin for a while, pulled them, and then threw that into the grain alcohol. But after a week, it just tasted really bizarrely industrial (I don't know how else to describe it). So I tossed in a new set of spices, and after a day there was a noticeable improvement (though I pulled the cinnamon and cloves again after ~4 days). I'm just kinda throwing poo poo out there. Does anyone have experience with this sort of infusion? Is Cinnamon just super hard to work with, and I'm better off dropping in some Goldschlager after the fact? Anyone know how to get subtle vegetable flavors (sc. the pumpkin) to rise to the fore? I've had some really drat good homemade nut cordials in Europe. When I asked how they were made, it turned out to be fairly simple. Take green nuts (underripe nuts, in some cases still in the surrounding husks*), soak them in vodka or other neutral spirit for six weeks, strain/filter and add a lot of sugar. I have a batch of green almonds about ready to be strained off now, will report back once I have it finished. As for where to get green nuts if you don't have a tree, I stumbled on them in a small Persian market. Farmers' markets might be another possibility. 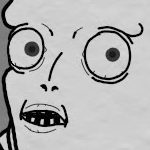 I also have some vodka I soaked with Thai bird chiles that turned out to be far spicier than I expected. It should make some very nice bloody marys at some point. *Hazelnuts are apparently soaked husks and all. I'm doing the same with the green almonds I found. I'm not sure of the flavor profile or possible toxin load of nut husks, though, so it might be a good idea to do research before expanding the practice. Walnut husks get really nasty as they ripen, from what I recall. Fun tip: do mini forced infusions with nitrous oxide. Strain out your infused liquor! You're in and out in under an hour. Works great. Not quite the same taste as a long infusion, but great for playing around with flavors. The best part is you don't have to waste a whole bottle of liquor to find out whether something will taste good - you can do a cup, decide you like it, and then do a larger volume. Ah, that's an idea. We get a ton of green pecans around come the season, which I realize is basically now. According to them, for a lot of stuff a 1-minute soak at pressure is best. I infused a half pint of lovely vodka with some fresh horseradish and cracked peppercorns a while back. Made for the strangest, spiciest shots I've ever had. They were really good in the oddest way. I've been meaning to make some more because it made the most fantastic bloody marys. I do it longer, but I tend not to do crazy spices that would taste bad if given too long. For fruit, there's no downside in over infusing. More likely, it gets everything out that it's going to in the first couple minutes. Still, I find half an hour works great for me, so give it a shot! You can always taste it and re-pressurize with another NO2 cartridge if it's not strong enough. Gentlemen of taste, refinement, luxury. Women want us, men want to be us. Right now I have some dark cherry liqueur that's been going for about a month and a half and it currently tastes a lot like cough syrup. Will that go away over time? Yeah it will. I take it you've already sweetened it. Let it age for a month and see where you're at. If it's still cough syrupy at that point you may want to up the sweetness/dilution a bit. Also adjusting it with a bit of orange peel spirit might be useful. I find this discussion incredibly bland and disinteresting. That coffee/vanilla infusion sounds amazing. Did it start out as a white or spiced rum? Has anyone had experience in infusing lychee? Are you bashing the cinnamon stick up before you use it? Also how fresh is it? dried cinnamon can lose a lot of its flavour over time. Cinnamon gets most of its flavour from cinnemaldehyde which is not really soluble in water but quite soluble in alcohol. You may have better luck getting the cinnamon flavour with a higher proof spirit. You can't really buy stuff like everclear over here so I haven't tried it but it might be worth a go. If you do I would recommend infusing the cinnamon into the everclear seperately and then mixing it in with the rest. I would carry on using the spirit you have been for the rest. If you are already having problems with bitterness you don't want to be using a higher proof for everything. Cloves are very pungent and will overpower pretty much anything. I would take them out after a day or two, and let everything else continue to steep. This doesn't really have a downside because the clove flavour infuses very quickly so you can chuck some in for an extra day after you have steeped everything else if it's not clovey enough. Or you can infuse the cloves seperately and then mix the spirits together to taste before ageing. I have never tried to infuse spirits with pumpkin so this is purely speculation. Have you tried roasting it on its own in cubes first? This would drive a lot of the water out and may help with the infusion. Another thing to try would be frying it first in a very tiny amount of butter or other fat. This will again drive some water off but also may draw some of the fat/alcohol soluble flavour out of the pumpkin and into the fat which will make it move into the alcohol more easily. Don't use much butter at all though or you will still end up with a weird cloudy drink. Another thing you can do to help infusion is to kickstart the weaker flavoured thing by putting it in the jar with the alcohol first and warming it gently for a while to help dissolve the flavours into the alcohol before adding the rest of the infusing agents. Do this by sitting the closed jar (so you don't lose any alcohol) in a bowl water that feels warm (not hot) if you stick your hand in it. Do not apply direct heat to the jar or even the water with the jar in it. Just use warm water out of the tap and change it when it cools. If you overheat the closed jar it will explode and if you are applying direct heat it might explode in a fireball. Also if you warm it too much you risk destroying some of the flavour. I've known a few people who swear by sticking the jar in the dishwasher before running it. Again I've never tried it and I would really only recommend this for skittles etc where you are aiming more to dissolve them than actually infuse them and the flavours are mainly artificial and tend to withstand the heat better. It started out as a generic unspiced "dark rum" which was sort of golden brown in colour like a budget Mount Gay. It went black almost straight away but I left it infusing for quite a while after that. I have always found that Tia Maria etc don't actually taste much like coffee but this stuff really does. Out of all the infusions I have made, this is the one that has improved the most from ageing. If you make it, taste it once a week or so and you will really notice the flavours developing. Vanilla flavours age really well and are a good addition to pretty much any spice based drink. Also when you filter the coffee and vanilla out, let the vanilla pod dry out and then stick it in a jar of sugar for delicious flavoured sugar. Swampface: that horseradish/pepper infusion sounds amazing. I'm going to have to try some of that! Although now I must know if anyone has tried it with wasabi? Thanks dude. I'm actually using grain alcohol (190 proof). I found out you can buy that in Connecticut of all places, so... yeah. Before that, it was "Devil's Springs" which is like 160 proof, but just tastes like balls. But I had good luck with the trick where you run it through a Brita filter seven times--not good enough to drink, but good enough to infuse. So you're saying I *should* crush the cinnamon stick up? They're the $.69/jar spices from the Ethnic Foods aisle, so I'm sure they've been sitting around for a while (not that the McCormick ones are any better, but you know what I mean). I figured it'd be easier to pull intact, and you get pretty good surface area on it anyway since it's hollow, but I'll give it a go, sure. When I did the pumpkin/spices in the skillet, I thought about putting a little oil in, but didn't know how that would interact with the alcohol (I was picturing a gross slick all across the top), and I figure just cooking in spices has worked for fruitier ones (blackberry reduction with cinnamon, cloves, and vanilla, set it for two weeks in honey dissolved in grain alcohol, finish with a little Frangelico--c'est fantastique). But if the oil slick's not too bad, that sounds like the perfect solution, though roasting would probably see less particulate. All awesome advice! Thanks! I actually made this exact kind of thing last year (and will probably make it again this year). I made mine with Bacardi 151 so your results may vary if you use something out, but what I made turned out to be a huge hit. You've already gotten some good advice, but this is just my recipe. When I put it through a coffee filter, I sweetened it with honey and brown sugar. It came out really, really good, particularly mixed with cider, and since I started off with overproof the product was still very, very strong. Mixed with cider or baileys, it was very tasty. The flavor was pure pumpkin tastiness. Yeah, I just roughly bash mine around a bit and maybe break it once or twice so it's got a lot of new cracks and newly exposed surface. It should still be fairly easy to get out. It does have a fair bit of surface area already but if it has been sitting around for a while then a lot of the more volatile flavours will have escaped from those surfaces. If you rough it up some then you are exposing fresh surface which hopefully will have more flavour potency. E: About the fat, if you use much it will definitely form a gross oily slick. However a very small amount should be soluble in the alcohol, I am talking about a thin coating from a tiny knob of butter. I suggested butter because not only is it tasty but if you use a tiny bit of butter you will end up with even less oil in your infusion because butter contains a fair bit of water which will boil off. Also if you use butter and you end up with too much and it does form a gross slick you should be able to stick it in the freezer for a bit and then fish out the solid butter. When I made carmelised onion vodka I fried the onions in a minimal amount of butter to carmelise them and had no problems with my infusion. If you do this, let the pan cool and then swill it round with some of the alcohol to collect all the tasty stuff that's still in your pan and add that too. Great thread so far, guys! The only infusions I've ever done was some skittles vodka many years ago, but this has inspired me to give it another shot. This question might be a bit odd, but has anyone tried infusing with beans before? I absolutely adore sweetened azuki beans and thought that might make an interesting liquor. The only thing I'm worried about is the lectin content in beans as I'd rather not end up with a drink that induces nausea and vomiting(at least before consuming large quantities). I know boiling can reduce those levels, so would it be advisable to do that first? Hm. Yeah I'll think about sweet potatoes if the present formulation doesn't see results. That really intrigues me. Also I thought the Cassia thing went for all grocery store cinnamon--like it was up there with "no westerner has ever tasted actual wasabi ever" on the list of food lies. But after consulting this crazy propaganda chart I feel confident in being able to tell the difference (and quite worried about coumarin well okay not really). To the ethnic spice market (man I love living in a South Asian neighborhood)! I am so pumped to try all this stuff and make a non-shite infusion. I make my own vanilla essence: It's like an infusion, just overdone. I hope this counts. A few years ago I got a little carried away with a credit card and bought half a kilo of vanilla pods. I dumped about half of them went into a huge bottle of vodka, seeds removed and added seperately. Stored in a dark place and shook every few months. I started using it after a couple of years. It is amazingly good, almost every dessert I make these days is vanilla flavoured. I'm down to about 1/3 a bottle now (I gave about half of it to give away as christmas presents)... My issue is now some of the pods are starting to stick up out of the liquid. Is this a problem? Given the copious amounts of alcohol everywhere I'd be suprised if anything could rot, but I'm paranoid about ruining years of work. Leave it, transfer to a new bottle, or top up with vodka? Once this lot's gone I'll be very interested to try that vanilla/coffee rum, and will probably try a ginger gin. I think a basil vodka could be interesting, but I've no idea what quantities I should be looking at for that. My favorite is blackberry vodka, which I've now made 3 years running, with a bigger batch each year to account for all of my friends falling in love with the stuff. I soak blackberries in vodka for 3 months, age a couple more, and sweeten lightly. Another hit this year was cherry vodka--royal ann cherries, soaked for 1 month, then sweetened a bit, tastes like fruity amarretto. Yum. It was oft-repeated advice in the old thread, but, for your pie type infusion, run infusions of each ingredient on their own, and experiment at the end with ratios (notes!) of each flavor to come up with something you really like. Blueberry Vodka per and post straining. dried fruit is awesome for infusing. I'm actually really curious how those banana chips turn out for you. On the one hand, dried fruit (apricots, cranberries, mango, etc) do brilliantly in infusions, but banana chips are less dried and more fried. Also, dried fruits definitely bring a different quality to an infusion--more of a candied, almost bordering on caramelized type of fruit flavor, instead of something tarter or fresher-tasting. I guess my concern, with the banana chips, would be that it would end up tasting more of peanut oil (or whatever they've been fried in) than banana. Is that a totally new infusion, or have you had a chance to taste it as it comes along? Are my concerns totally unfounded? I'm super curious about this now. It was one I did during the last thread and I had similar concerns at first. That's why I went with the smaller container for infusing. The end result tasted great though. Inspired by that one crazy dude in the chiles thread, I made habanero gin. It came out this totally poisonous color of yellow, but it actually tastes pretty good in a g&t. That being said, I'm not so sure I'd make a martini out of it. Next project is homemade tonic with Sichuan peppercorns. I have some nagas, and thinking of infusing a couple into grain alcohol and then sweetening to "palatability" with honey. Not going to make much because I can't imagine consuming more than a half ounce of that in a night, though. I'm planning on putting up a batch of this tomorrow, thanks for the idea. Obviously the seeds should come out; what about the peel? How fine did you slice the apples? I also want to put up some peach brandy. Again, stone comes out, skins stay on? If I were you, I'd peel both fruits if only because it's another face to expose to the infusion, to help the liquor infuse more completely. Also, for a month-long infusion, I might go for something as small as 1cm square; bigger than that and you will probably want to let it go for longer. Also, I can't tell you anything about peaches (I wouldn't be surprised if the pit is useless) but this amaretto recipe does call for apricot kernels and almonds, both of which are stonefruit pits, so maybe you could crack it open, pull the kernel out, and see if it has a use? I wouldn't do it without researching, though, and I wouldn't just toss it on top of your brandy infusion. At the least it could give you some weird, unexpected, potentially gross flavors; worst-case, it could leach something that could harm your health. Frankly, I'd just pitch it, but if you're into using everything it might be worth doing some research. Don't take out the seeds or stems, and leave the skin on. It will add a layer of complexity to your infusion that you will not regret. You'll want the slight bitterness from the stems/pits to dry out the finish if you're planning on sweetening as a liqueur. Although if you have a lot of peaches it might be fun to use the flesh for like pie or something and just infuse the pits. It produces a really delightful amaretto-like flavor. Last time I did it I chickened out and under-infused – give it 3+ weeks at least. Also the amaretto spirit (pre-sweetening) is a great addition to liqueur blends because of the aforementioned drying effect of its bitterness. Thanks for the tips! I think I'll probably leave the apple skin on (hoping to get some of that great color and tang) and dice it into small cubes like Nicol Bolas suggested. I actually thought that peach pits had enough cyanide in them to be dangerous, which is why I was planning to leave them out. After doing a little more research it looks like that's completely unfounded; you'd need to eat 10s of kgs of pits every day long-term for it to hurt you. Would it be a bad idea to mix the flesh and the pits in the infusion? Obviously the peaches will be very sweet, but I don't really know what effect the pits will have. I'm hoping to make something fairly sweet and easy-drinking, honestly. Go ahead and leave the pits in the infusion with the peach flesh. When my parents' tree produced a bunch of peaches last year I infused the flesh and pits separately and then just ended up blending them back together afterward. The peach spirit really needs the almond-like taste of the pits to be uh, tasty. Did you crack the pits open and pull out the kernel, or just toss the pit in wholesale? I only ask because pits are fairly sturdy and, while not booze-proof, I imagine it might take a longer time to get a more substantial flavor out of them if you don't pull the kernel out. On the other hand, the shell of the pit itself also might have some flavor; I don't know, as I've never tried. I told my boyfriend about this thread and now he really wants to do a chocolate vodka. Would it be best to use dry cocoa or try to find beans somewhere? I assume post steeping I'll need to sweeten slightly, or possibly steep with vanilla and just age out to get some mellow sweetness? Has anyone done a chocolate infusion, what did (or didn't) work? I was working with clingstone peaches, so I cut away as much flesh as possible and chucked them in whole. If I were to do it again I'd crack them with a hammer a little bit, but still use the whole thing. It would be worth your time to seek out cacao nibs, since you'd have a drat hard time getting your cocoa powder to dissolve properly. Sharffen Berger sells nibs, but they're drat expensive. If you know any stores with a tippy top notch bulk food section you might be able to get some there. I would taste it every couple of days, since the chocolate probably infuses pretty quickly, like dry spices. You will almost certainly want to sweeten it, but after you strain it let it age for at least a month before sweetening, since the profile may mellow quite a bit. I've wanted to do a chocolate infusion for a while but never got around to it. Good luck! If you know any stores with a tippy top notch bulk food section you might be able to get some there. Amazon is a monster that has everything. I learned this last week when my local grocery store wanted to charge me $9 for a little thing of whole cloves. I still can't figure out what that was about. I had it down as a do not do in the OP to err on the side of caution and make sure people knew to consider the danger. I didn't want to give the impression that there was no risk at all and end up partially responsible for the death of someone who rammed 400 raw almonds in a jar to make their own amaretto and then necked the lot. Since we've got into it anyway; prunus/malus stones don't usually actually contain cyanide but some contain cyanogenic glycosides which can produce cyanide compounds when metabolised. Generally (but not always) these glycosides are within the kernal itself so you have to actually break the stones open to access them. These compounds are found in low levels in loads of things we eat (coffee, alfalfa, radishes and a ton of other stuff.) They also tend to not withstand heat well at all and so most things that contain a lot (almonds etc) and are comercially available have been heat treated prior to sale. This is not true in some countries but other countries have outright banned the sale of bitter almonds and non-heat-treated prunus seeds. There is an absolute shitload of misinformation on the internet about this ranging from "one appleseed will kill you" to "apricot seeds were only banned because they're the magic cure for cancer big pharma doesn't want you to know about!" As long as you are aware of the potential for harm then you will probably be ok. It is possible to poison yourself with apricot etc stones, this doesn't mean it is likely but it also doesn't mean that you should ignore the possibility. 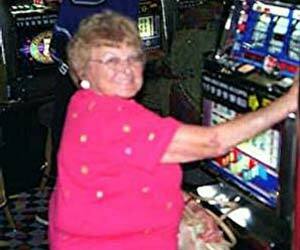 For healthy adults we're normally talking upwards of 60 stones to have a lethal effect. This isn't out of sight for an infusion and glycosides will dissolve well in ethanol so you will concentrate them. Also body weight and health are massive factors in how likely you are to suffer adverse effects. Basically use common sense, if you are using lots and lots of raw bitter almonds etc then you should probably heat treat them first or at the very least don't give the resultant liqueur to any pregnant women, sick people or children. I can't find any links amidst all the "magic cancer cure" crap but as far as I can recall the only people that have died from cyanide poisoning from eating prunus seeds in my lifetime were very small children or people who were already sick and eating ridiculous quantities of apricot stones daily in the hope of curing their cancer. This is the best reference I can find that doesn't require subscriptions. It's not the best but it covers the toxicity quite nicely. Unfortunately it is hard to pin down a lethal dose for poisons that act so quickly because people tend to die before they can say how much they ate. Also not all stones (even from the same tree) will contain the same amount. This also only addresses apricot stones. Bitter almonds, cassava etc contain a higher proportion of glycosides. On the plus side cyanides really don't tend to be cumulative. I have never tried chocolate infusions but I would guess that a greater fat content would increase infusion. I don't know if anyone here has tried it but you might have better luck with white chocolate. Cocoa itself is not particularly soluble in either water or alcohol. Most of the cocoa you buy for hot chocolate has been treated with basic (alkali) chemicals in a process called "Dutching" which makes it more soluble in water. So you may be able to infuse from hot chocolate mixes with much greater success. Untreated cocoa such as nibs may not infuse so well but it could be worth a shot. Particularly as they are very strong flavoured so it may not matter if they only partially infuse. I have never tried so so again this is speculation.